Note: You Can Search by Listing Status on the Advanced Search. The information on this page explains what the Spokane MLS Status of each listing means on the Spokane MLS Property Search just under the photo slide show and above Property Description. We hope this page will help our users have a better understanding of each status when they see it on the listing pages. It is important to understand that the Status of each Spokane MLS Listing can change hour by hour, day by day depending if the seller has accepted an offer on their listing from a buyer. When a seller and buyer have entered into an agreement by both parties the purchase and sale agreement is considered Mutually Accepted and at point will change from Active Status to a Contingent Status. Normally when a Contingent Status is removed or changed the Spokane MLS will change the Current Listing Status to: Pending which are also posted on our website for our users convenience and accuracy of our Spokane MLS Listings. You can search the Spokane MLS SOLD Homes by going to our MLS SOLD Homes page. You can also see the Sold Status on our Spokane MLS Market Report Updates page which shows the Spokane Multiple Listing Service (MLS) Active, Under Contract, and Sold Properties with: Address, Sold Price, Sold Date and DOM (days on the market) on 3 charts. MLS Market Report Updates. 1. MLS Listing Status: Active >> This means that the property is Active and is still For Sale if the listing is still on our website. The Listing Status information comes directly from the Spokane Multiple Listing (MLS) when the new Spokane MLS Listings are downloaded daily from their database to our SpokaneHomesForSale.com website. 2. MLS Listing Status: BOM >> This means that a property was recently in a Pending Sale SOLD status in the Spokane Multiple Listing (MLS) but for some reason the sale did not finalize or close and came back on the market. Sometimes this is caused by buyers financing not going through or the home inspection was not agreed to between the seller and buyer etc. 3. MLS Listing Status: Chg Price >> This is to let potential buyer's know there has been a price change recently. The price change is normally when it has been lowered but sometimes you will see that the price has been increased. You will notice on our website that we have a Red Arrow for lowered prices with how many days ago it was lowered. We have a Green Arrow to show if a price has been increased with how may days ago it was increased. Increased prices will normally come from new construction homes, or if a seller has made some new major improvements to the home. Let us know if you have other questions about price. 4. MLS Listing Status: Ctg-Inspection >> This means that the property has recently become a Contingent Sale but the buyer is in the process of doing their home inspection. Once the home inspection is complete and approved by the buyer the home inspection contingency will be removed and the property goes into Pending Sale SOLD status and is removed by the Spokane Multiple Listing (MLS) from all Internet websites. 5. MLS Listing Status: Ctg-Other >> This is a property which has gone into a Contingent Sale Status Contingent upon different types of Contingencies that must be resolved between the seller and buyer. There are many other contingencies can come under this Contingency. Financing, Seller Finding a new home, Special Inspections, Buyers Preview the home etc. 6. MLS Listing Status: Ctg-Sale Buyers HM >> This is a property which has gone into a Contingent Sale status contingent upon the buyer selling their home. Sometimes a seller will have the right to continue to market their property and take back up offers. The seller may also be required to give the buyer a specific amount of time to remove their contingency if they want to purchase the property. If you have any other questions on this status let us know. 7. MLS Listing Status: Ctg-Short Sale >> This is a property that the owner is selling a home for less than the amount the current owner owes the mortgage company is called a short sale. Buying a home that is a short sale is different from buying a property that is actually owned by the bank, known as an REO, or real-estate owned property, or a property that is in foreclosure. Short Sale listings may have multiple offers and the banks want the highest offer they can obtain from potential buyers. When buying a property that is a Short Sale be prepared to compete with multiple offers on the property and for delays in the process. 8. MLS Listing Status: New >> This is a New Listing which recently came on the market in the Spokane Multiple Listing (MLS) which will show as a New Status for several days and then the Status will change to Active. Note: sometimes you will see New Spokane MLS Listings without a photo. If there is no photo it should be in the Spokane Multiple Listing (MLS) database within a few days. Note: we have no control over the photos coming from the Spokane Multiple Listing (MLS). You will sometimes see Image Coming Soon on the New Spokane MLS Listings. Check back in a day and they should be there if the photos were downloaded into the Spokane Multiple Listing (MLS) database. The Spokane MLS allows each listing to have a maximum of 20 photos. See our Extra Large photos in View Gallery. 9. MLS Listing Status: Pending >> This is listing that was showing a Spokane MLS Listing Status of: Active, BOM, NEW, or a Spokane MLS Listing that was showing Current Listing Status: Contingent etc. When a Spokane MLS Listing Current Listing Status changes to: Pending that means that the Spokane MLS Listing has changed from Active, BOM, NEW, Chg Price, Ctg-Inspection, Ctg-Other, Ctg-Sale Buyers HM, Ctg-Short Sale Status to a Spokane MLS Pending Sale Status. At this point the home is basically SOLD, unless something goes wrong with the buyers financing, appraisal etc. 10. MLS Listing Status: SOLD >> This is a New SOLD Listing which recently came off the market in the Spokane Multiple Listing (MLS) which will show as a SOLD Status for up to three years in the Spokane Multiple Listing (MLS). You can search the Spokane MLS SOLD listings by going to our MLS SOLD Homes page. The page will show you SOLD price and the date the sale closed. You can also see the SOLD date and closing date just under the photo slide show and above Property Description on the listing detail page. The Spokane MLS Market Report Updates are a great way for Sellers and Buyers to know all about the homes for sale and SOLD in their areas. Our Spokane MLS Market Report Updates have all of the important information on our MLS Market Report Charts so you can compare properties. Active Properties Chart and Properties Under Contract Chart shows the data: Address, Bedrooms, Bathrooms, Living Square Feet, List Price, Cost Per Foot, DOM (days on market) plus the Sold Properties Chart includes the Sold Price and the Sold Date. The reports are updated daily. You will see the new just listed properties, properties under contract and the sold properties in your area you want to buy or sell a home. 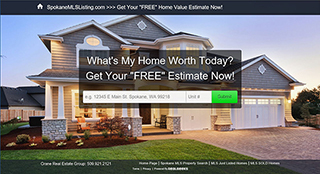 This information is fantastic and is downloaded daily from the Spokane Multiple Listing Service (MLS) directly to our SpokaneMLSListings.com website for viewing by our users.